In our new house, we have a breakfast bar in the kitchen/sunroom. I have never had that before and therefore, never needed stools before. I had NO idea how much they cost. OMGoodness! I started looking at my nice local shops that I love around here. They were near $50 a piece. So I started looking at Ikea. $30 a piece. And then I started looking at Target. Still... $24 a piece and that was for the cheapest ones they had that were of course, made in China plastic pieces of crap. So I made a choice, that I wasn't going to buy them that way. 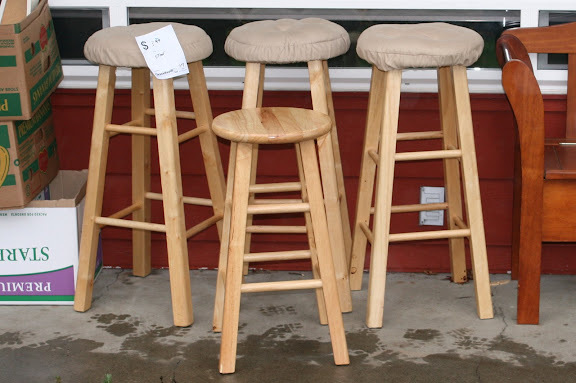 To support the 'new stuff' industry is against what I believe for the most part anyway... but how was a going to find a used set of 4 bar stools? I decided that I would get whatever wood stools I would find at my trips to Goodwill for various things, and then paint them all the same color, and make cushions that were all the same color. So they went together in sort of an eclectic, funky way. I enjoyed the idea of my choice and started hunting the various Goodwills as we went to drop off our various donations. 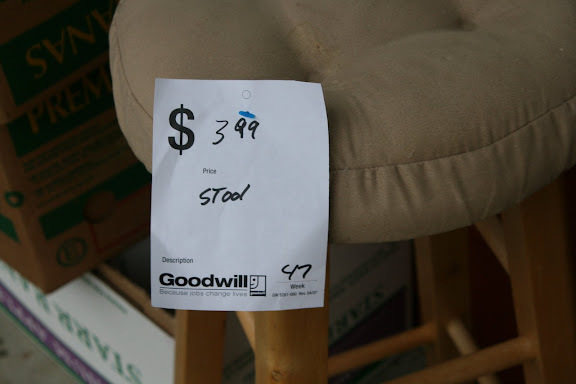 Last week, I found two stools at our local Olympia Goodwill. One was shorter than the other and only one had a cover, but they were the same style and in good shape. So I picked them up anyhow, thinking that Alex could use the shorter one and Cyan the taller due to their various sizes. I was excited. Then, this morning, I went to the Lacey to get Logan's haircut and decided to drop off my things in the van at the Goodwill there instead of driving back to Oly. And there I found two more stools! The same brand, the same size, the same set, even the same cover. I could not believe it! The two on the left were from the first trip to the Goodwill in Oly. The two tall ones on the right were from the Lacey trip today. Talk about luck! You can't even tell and I didn't have to do anything to them at all! And here is the price tag. What a beauty! When I am in a Goodwill, Value Village, or whatnot, I always stop at the book section. Sometimes I find something, most of the time I don't. Usually I look through board books for Logan, my mini-book lover, and sometimes I have something else specific in mind that I want a better copy of, etc. (Right now I am looking for Harry Potter books #2 and #3 in hardback, to complete my used set.) Books are another passion of mine. I remember my dad reading to me when I was little and I have continued that tradition with my kids. We are avid users of the public library, but enjoy having a small library of favorites that we update every now and again with new books we have found and love. But who wants to pay $10.99 for a board book for a 1 1/2 year old that may or may not spill juice on it in three days? No thank you. So I rarely buy them new. My hunt of the Goodwill book section is often futile though, for I am as picky in books as I am in everything else. Today though, I scored big time. 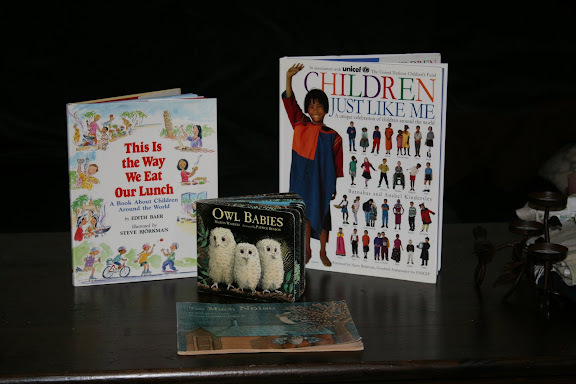 The top two books are on other cultures and food traditions, and I plan on adding them to our homeschool library. The bottom books each have stories behind them... which you can read about here. With the months of bad luck, the broken teeth, the broken arm, the bad days, and neversummer weather... I have been really enjoying my string of good luck lately. I can't even say how much. It feels like I have a new lease on life a little bit. Not that I was ever really depressed, but when your friends take you to dinner because "you have to have a good day some time soon"....... well... those good days have come. I have been blessed in so many ways lately. Maybe it is Karma, maybe Providence... I don't know, but I am really thankful... and I feel very loved by my universe. Oh what great finds. Love it when you find what you are looking for. I seem to have rotten luck with our good will, or maybe I am just too picky!! I love it when a plan comes together. I hove hunting furniture at Goodwills. Yes! My next purchase is bed frames. For the five of us, we have two bedframes. One will not work in the new house and the other is a crib. So basically, within the next 6 months, we will all need new bedframes. I will keep looking at goodwills... I have found good ones there before, but didn't need/couldn't afford them. Hey Great job, you seem to work miracles sometimes huh?, Lol, Keep it Up Val.